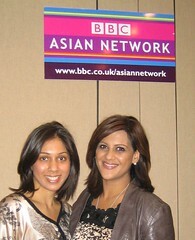 Sonia Deol from BBC’s Asian Network interviewed me this afternoon about my book “Bollywood Weddings”. During the live radio broadcast, listeners called, texted and e-mailed in stories of how they met their spouse and views on using Internet dating websites. The interview was a blast – Sonia Deol is as charismatic, friendly and thoughtful in person as she is on-air. Enjoy!! !